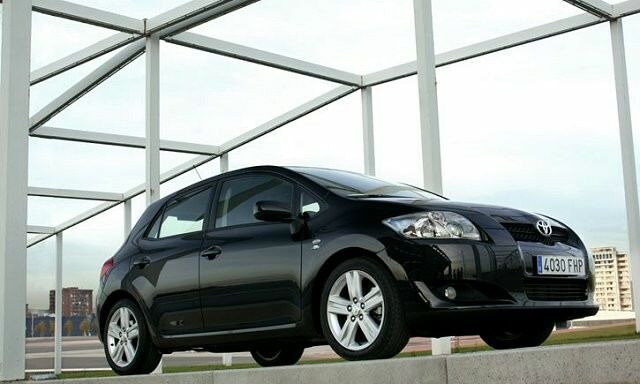 Toyota’s Auris is the hatchback relative of the hugely popular Corolla saloon model. Toyota’s Auris is the hatchback relative of the hugely popular Corolla saloon model. Though offered in both three- and five-door guises the less practical three-door model is uncommon. Introduced in 2007, Toyota’s reliability, sensible pricing and good specifications means it’s a big seller here, picking up where the Corolla hatchback left off. Competition comes from Ford’s Focus and the Volkswagen Golf. Toyota is big in Ireland for good reason, and the Auris underlines why. Comfortable, practical, sensibly priced and decently specified as standard the Auris does everything you’d expect your family hatchback to do; with the firm’s long-standing reputation for reliability backing that up. Toyota offers a three-door model but it’s an unusual sight, the more practical, and easier to get in and out of five-door making up the majority of sales. Used choice is extensive, as so many are sold new. Engine options include 1.33- and 1.6-litre petrol choices and a 1.4-litre D-4D turbodiesel. Toyota’s expertise and experience in hybrid models is also apparent with the Auris additionally offered in HSD hybrid guise with an electric motor assisting a 1.8-litre petrol engine. It’ll run briefly on electric power alone, offers impressive fuel economy and a tax-friendly 93g/km CO2 figure. Both manual and automatic transmissions are offered on the non-hybrid models, both being six-speeders. The HSD hybrid is a CVT automatic only. Not surprisingly the Auris follows Toyota’s traditional trim levels, with Terra the entry point, followed by Aura, Sport and Sol. The original Auris was facelifted early in 2010, with different headlamps, front grille, a sharper interior and more economical engines. Any trim above the non-air conditioned Terra is worth considering, but the largest selection comes from the well specified and smart looking Sport models. All feature alloy wheels, the Sport model’s being larger. Engine choice is either the 1.33 petrol or the 1.4-litre D-4D diesel, the latter delivering 4.8 litres/100km combined consumption and emitting just 128g/km of CO2. This engine isn’t particularly punchy but it’s decently refined and is the best all-round choice. It’s difficult to argue against Toyota’s Auris as a family car and huge sales are testament to its all-round appeal. Comfortable, quiet and economical, it’s not the last word in excitement, but it’ll do absolutely everything you want your car to do with the minimum of fuss and effort.